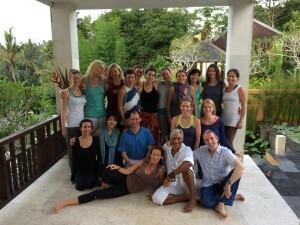 Wendy – I wanted to thank you SO much for the most wonderful 4 weeks in beautiful Bali with you, Ananda and Carlos. I absolutely loved it and am so grateful to you for so gently encouraging me to come along and join in. I’m SO glad I did! Such a nurturing and safe environment as created by you, such a wonderful group of students and just the most outstanding teaching – your vast expertise always infused and delivered with your inimitable combination of humour, grace, playfulness and sheer selflessness. I honestly don’t know how you do it with such unfailing enthusiasm and love. You are such an inspiration and I know I speak for everyone when I say this. Thank you so very much for everything. Maya – The Holy Trinity of teachers inspiring from their hearts. I have learnt more about myself this last month than I could have ever imagined. Thank you! Katie – Thank you for a life changing opportunity in an awe inspiring place”. Tanya – This teacher training far far exceeds what I thought it would be like, Thank you! Karen – I am amazed at how much I have learnt from what Carlos, Ananda and Bridget offer. Thank you! 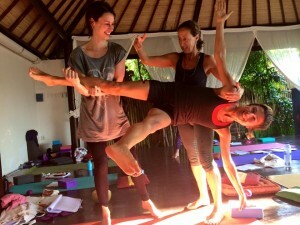 Due to the overwhelming success of the 2011, 2012 & 2013 – 200hr teacher training in Bali. 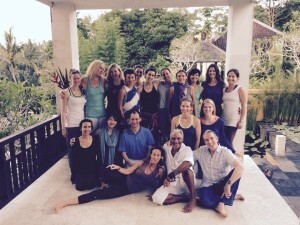 Bridget, Ananda and Carlos will be returning to Ubud in 2015 to run another 200hr Anusara teacher training. Our training is inspired by the deep desire to share our passion for yoga. We bring together more than 60 years of practicing and teaching. Bridget, Ananda & Carlos are connected by the same tantric root in a unique fusion of traditions. depths of yoga wisdom with the master teacher Carlos Pomeda. • Bandhas: the pelvic floor and core muscles, mula bandha, core stability, energy flow, abdominal core, uddyana bandha, jalandhara and jiva bandha. Philosophy The law of karma and its understanding Panca Kosha, the five bodies Chakra, the anatomy of the subtle body Mantras, a way to express joy and life, and how to learn Sanskrit and the voice in a funny way Samkhya, a cosmology based in a scientific approach to the vibrations, and Tatwas Vedanta, the experience of God’s grace in here and now. Tantra, the realisation of the divine in everything and everyone…all three the base of the yoga philosophy…and how to integrate this knowledge in our daily life. What is the inspiration behind your decision ? Accommodation is available in deluxe on site accommodation at Bali Bliss or in very reasonably priced rooms/guesthouses/bungalows nearby.